GENEVA, Nov 11 2018 (IPS) - What is the link between the current civil war in Syria, the austerity policy imposed by Germany during the last economic crisis or the Arab-Israeli conflict? Its origin, which lies in the world that was born a hundred years ago, inside a wagon in the middle of the Forest of Compiègne, northeast of Paris. 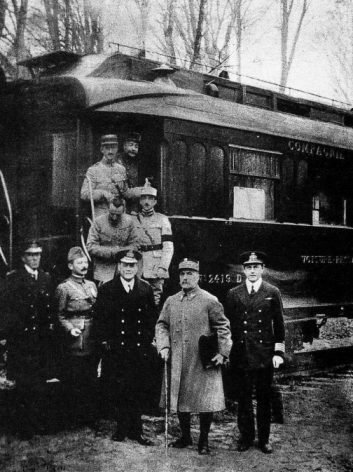 Indeed, it was on November 11, 1914 that the signature of the Armistice between the Allied powers and the German Empire took place, in the above-mentioned wagon. This event marked de facto the end of World War I (1914-18), a conflict that changed the world and still today projects its shadows. The Armistice was followed by the Paris Peace Conference and, as a consequence, the Treaty of Versailles, that of Sèvres and many others. The birth of the League of Nations, the policy of “reparations” or the dissolution of the Austro-Hungarian, German and Ottoman empires, and in part the Russian one, were other outputs of the end of the Great War. The consequences of some of these historical events are still present today in the international agenda and determine the lives of millions of people, one century later. The dissolution of the Ottoman Empire, through the Treaty of Sèvres of August 1920, opened a Pandora’s Box that we still strive to close today. Three examples: the Palestinian-Israeli conflict, the civil war in Syria and the case of the Kurdistan. Let us start with the last one, with Kurdistan. Sèvres foresaw the holding of a referendum to decide its future, a referendum that never took place. The uprising of Kemal Atatürk in Turkey, the subsequent war and the Treaty of Lausanne (1923) were the main causes, but the disunity between the Kurds we could call “pragmatic” and the supporters of a greater Kurdistan also influenced. Similarly, the fact that Sèvres planned to include the oil rich province of Mosul within the territory of an eventual free Kurdistan (which the British were coveting) helped to tip the balance in favor of Turkish interests. Another unfortunate legacy is, in part too, the current civil war in Syria. It is widely known that the origin of this conflict is related to the emergence of the Arab Spring, the resilience of the al-Assad regime, the infiltration of radical jihadist groups, and the interests of many regional and global powers. However, part of the current war’s cruelty is intimately related to a State, Syria, resulting from the end of the WWI, with their borders designed to satisfy, exclusively, the French and British colonial interests. A division based on a Franco-British secret agreement taken before the end war, the Sykes-Picot agreement of 1916, that unscrupulously mixed and divided diverse ethnic and religious groups. Even more, we cannot ignore the icing on the cake of all conflicts, the Arab-Israeli conflict. Its origin is linked to the Balfour declaration (1917) before the end of the Great War. This declaration was assumed by the San Remo Conference (1920) -also linked to the Paris Peace Conference- within the framework of the complex maneuvers of the great powers, and other influential groups of interests, during the reshaping of borders of the post-Ottoman Levant. In another vein, one of the main elements that also defined the treaties resulting from the Paris Peace Conference, and especially the Treaty of Versailles, was the policy of “reparations”. This policy mainly entailed that the countries that lost WWI had to face the payment of enormous sums to compensate the Allies. This policy, so aggressive, led to the resignation of a young economist from the British delegation at the Peace Conference, called Keynes, who warned of the destabilizing effects in the economic and financial field that this could have. Indeed, this was one of the main causes of the German hyper-inflationary crisis of the years 1920-23, in which a loaf of bread reached the cost of billions of German marks. The influence of this crisis on the discrediting of the Weimar Republic and the consequent rise of Nazism is well known. All of this and more, a hundred years ago, started in a wagon inside the Forest of Compiègne, northeast of Paris.